World Tools Pro supports CS5 and later and has all the functionality of World Tools, plus the functionality needed to properly composer Far Eastern Scripts including Chinese, Japanese, and Korean languages. Additionally, World Tools Pro offers a Composite Font Editor for creating custom composite fonts which automatically uses you choice of the font for each writing script you are using to compose your text. World Tools Pro is quite simply the most complete solution available for composing multilingual documents including Hebrew, Arabic, Indic languages, Chinese, Japanese, Korean and more! Price – you don’t need to buy a whole new program just for right-to-left or CJK composition. Timely updates – historically, the ME updates took much longer to be released than the regular ones. For example: at the time World Tools was released for CS5, the current CS4 ME version was 6.0.2, while the US version was updated to 6.0.5. There were quite a few bug fixes since version 6.0.2 that ME users were not able to benefit from. There is no reason to assume the situation will be any better for CS5. Use of right-to-left functions in the CJK versions of InDesign – The ME versions and CJK versions of InDesign are mutually exclusive. Localized interfaces – World Tools can be used with any version of InDesign – no matter what the language of the user interface might be. The ME version only has English (IE), French, Hebrew, and Arabic interfaces. 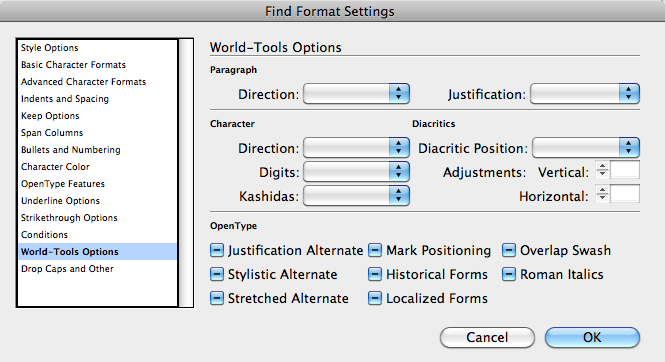 Additional Functionality – World Tools also includes the following functionality not present in InDesign: Spread Numbering, a function to straighten existing quotes, and the ability to intelligently apply character styles to texts of different languages. Universal Solution – If you need to compose both Far Eastern and Middle Eastern languages, World Tools Pro is simply the best and only option! Composite Font Editor – If you are deciding between the ME version and World Tools, the Composite Font Editor might very well sway your decision! Prior to InDesign CS4, the only way to work with documents which contain right-to-left components (which are necessary for Arabic or Hebrew composition) was by using the ME (Middle Eastern) version of InDesign. With CS4, this has all changed. Adobe has included an additional composer called the World-Ready Composer which is capable of composing right-to-left languages. The World-Ready Composer also has the added capability of composing Indic languages. Under the hood, all of the functionality of the ME version of InDesign is there in every version of InDesign CS4 and CS5. Adobe has decided to keep this functionality hidden. The ME capabilities are only apparent when one tries to open ME documents (they open almost flawlessly in CS4 and later). 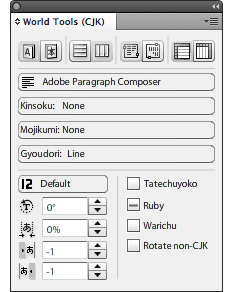 The composer which is enabled by default is the regular composer used in previous versions of InDesign which does not support right-to-left text. CJK features have been dormant in InDesign for quite a few versions already. However, until today, the only way to actually control those features was to purchase a dedicated Chinese, Japanese, or Korean version of InDesign with a localized interface. There is a separate composer called the “J” (Japanese) composer which has the features necessary to properly compose those languages. This includes features such as character rotation, special spacing settings, Ruby and Kenten adornments, etc. 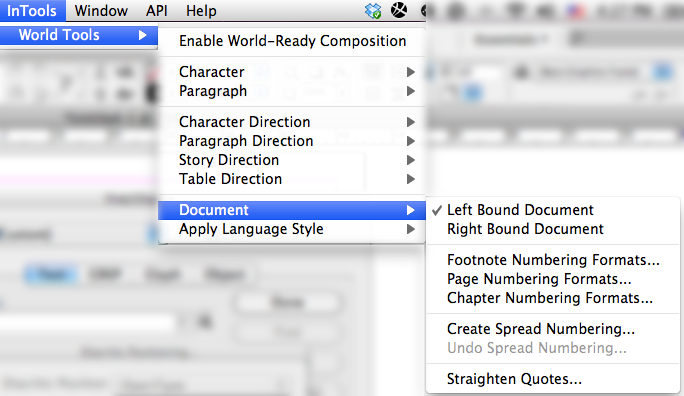 This adds up to three separate composers which can be used in InDesign. Unfortunately, each composer has its place, and each paragraph can be composed by only one of these composers. The Roman composer can not compose any complex scripts. The World Ready Composer can not properly compose CJK languages, but it can properly compose Indic languages. The Japanese Composer can not properly compose right-to-left or Indic languages. This means, it is not possible to properly compose a single paragraph which contains scripts with different requirement such as Arabic and Japanese. To compound this issue, there is no single version of InDesign which exposes all three composers. The standard versions of InDesign only expose the Roman Composer. The CJK versions expose the Roman and Japanese composers, but not the World Ready Composer. The ME version exposes the Roman and World Ready composers, but not the Japanese one. World Tools was created to exposed this dormant capability within CS4 and later. It enables the World-Ready Composer and provides a user interface to be able to use it. 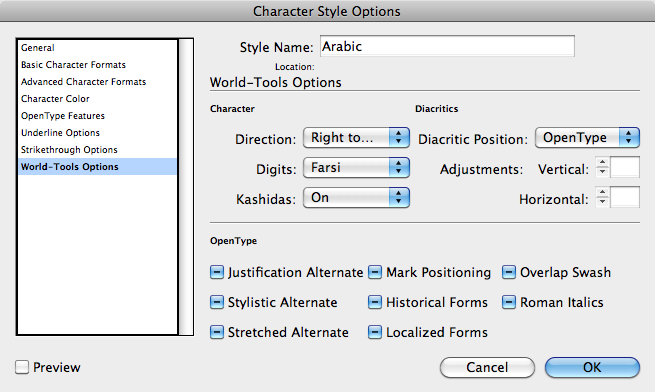 It was created to enable all users of InDesign to edit documents with Arabic, Hebrew, and Indic text. 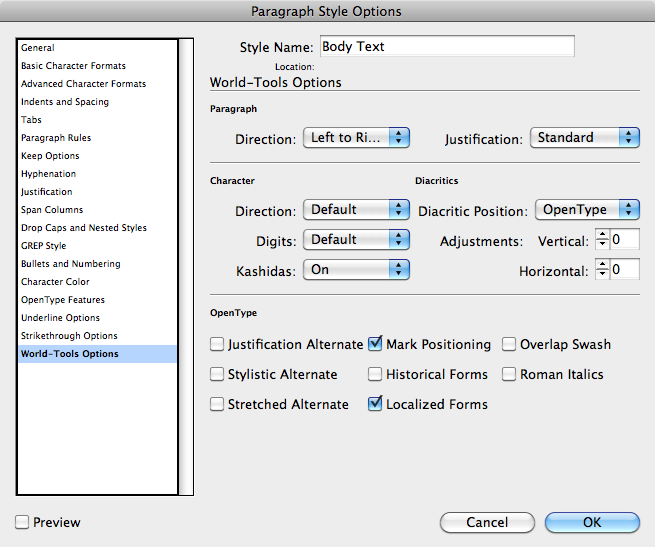 All right-to-left features are available within the paragraph style, character style, and find/change dialogs. Additionally there is a new World Tools panel for easy access to right-to-left features. 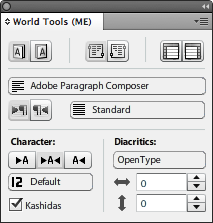 World Tools Pro (CS5 and later only) completes this picture with CJK support including exposing the Japanese composer and providing a user interface to control its features. Documents created using World Tools will open correctly even on installations without the plugin. What World Tools is NOT! World Tools is not a full replacement for the ME version of InDesign. Likewise, World Tools Pro is not a full replacement for the CJK version of InDesign. There are a few reasons why one might want or need to purchase the ME or CJK version of InDesign. The World Ready Composer in CS4 is pretty good. The one in CS5 is even better. But there might be bugs in the composer which the ME version addresses. We will address bugs in the user interface to the best of our ability, but any bugs in the underlying technology, are beyond out abilities to address. There is no guarantee by Adobe that they will even attempt to fix ME related bugs in incremental updates of CS4 and CS5. (On the other hand, there is no guarantees that Winsoft will fix them either.) This being said, we would like to receive any information on ME related bugs, so we can try to analyze them and alert Adobe of their existence. There are differences between the interface of World Tools and that of the ME version. We have made World Tools much more integrated in CS5, but the right-to-left functionality is only integrated into dialogs – not panels. There is however a separate World Tools panel which has all the right-to-left functionality in one convenient place. In the Story Editor, right to left text is only displayed correctly in the ME version. World Tools Pro does not offer control over every feature offered by the Japanese Composer. The CJK versions have some very complex dialogs for controlling certain features. We left out some of this complexity which we believe to be unnecessary and confusing. We consulted with experts who gave us their opinions on which features are needed. We believe the features we included are those needed by the vast majority of users. If you feel we left out a feature which is important, please let us know! This is a really great plugin. Hi, does anyone know if this works with CS6 pre-cloud version? This is a great plug-in indeed. Do you have a similar plug-in for FrameMaker? We need Arabic support there and a similar plugin will be just great and many will buy it. Please let me know. No. We don’t have something similar for FrameMaker. I would like to enquire if this plugin tool, World Tools Pro will be able to deal with languages like Tamil? Yea. I believe Tamil would work fine. You’d want to use the World Ready Composer for Tamil. I suggest installing the trial to make sure it meets your needs before purchasing. I wld like to number the pages of my book with Hebrew letters. I wld also like my footnotes, instead of having numbers use Hebrew letters. Additionally, I wld love to be able to use bullets with Hebrew letters that automatically go in the correct “Alef-Bet” order. Will this plug-in help me? There’s a “dumb quotes” command that can “dumb down” smart quotes. Can you explain please. I am using it for a english book with hebrew words interspersed in the text. Whenever a hebrew goes across to another line, the quotes come out the English way – a bit hard to explain! I’ve created a 250 page book in Hebrew (goes right to left) and just realized that all of my pages are being numbered (incorrectly) by indesign, for example; page spread 8-9 is reading 8-9 instead of 9-8, page spread 10-11 is reading 10–11 instead of 11-10. Any ideas how to tell indesign to number these pages staring on the right side of each spread on an already created book? You need to set the binding direction to right rather than left, but you might have to manually move the text frames to the opposite side. If all you text is running (i.e. no static objects on the pages), you can change the binding direction, delete the pages and auto-flow the text to re-flow it. Hello, I’ve just bought World Tools Pro in order to create packagings with occidental and arabic texts. (on Indesign CS5). Unfortunately, the ME Options panel doesn’t appear when I select it in the menu windows > World tools > world tools (ME). It’s just unactive. Tell me how make it visible.